…we have a range of sailing dinghies and catamarans. 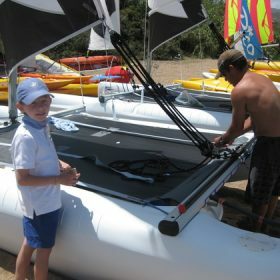 The equipment is aimed at both experienced sailors and complete beginners. Just getting started? These boats will really give you a taste for sailing. Together or single-handed. Fantastic & Fast. These babies really move when the wind is right and the crew is balanced. An instructor will be right next to you on a safety boat at all times whilst training. We have Laser Dart 16 Catamarans, Laser Bahias, RS Fevas, Laser Funboats and Laser Picos (Monohull). 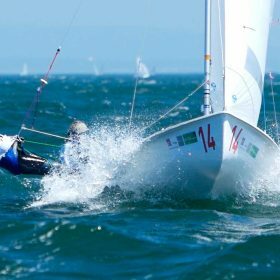 Latchi Watersports also offer sailing lessons. These can be hourly lessons or a course spread throughout your holiday. There is no age restriction for learning to sail in Cyprus. A sailing instructor will be onboard with you as long as you need, then present on a safety boat at all times when you’ve progressed to sailing alone. Handheld VHF radios are provided for all rentals as part of a safety kit, also including first aid kit and safety knife. A safety boat is always on standby even for the more experienced sailors. Trapeze harnesses are available for the larger catamarans. 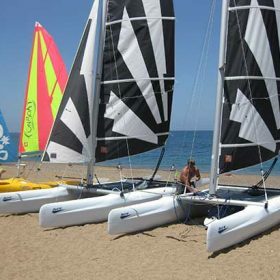 Latchi Watersports also have a range of windsurfing equipment, with sail sizes from 3m for beginners, children and training, right up to 6m for more advanced adults. Boards range from wide style boards for beginners to semi-sinking boards for more advanced water starters. Harnesses are also available. We also offer lessons for windsurfing. This involves the instructor being beside you on a safety boat at all times whilst training. We can provide instruction and training for RYA Dinghy and Multihull Sailing Courses level 1-3, Advanced Sailing Courses; Including Seamanship Skills, Day Sailing, Sailing with Spinnakers and Performance Sailing. We also offer RYA Youth Sailing Courses; Stages 1-4. Sailing is hugely rewarding – you need to try it, just once. Learning to sail is a challenge. Are you up for it? Come to Latchi Watersports. You’ll be glad you did! With the right instruction, you’ll be enjoying yourself in no time…. Magnifique opportunité d’être le capitaine d’un jour! Merci a tout le staff pour l’accueil , le briefing , les installations et , last but not least , ce matériel de qualité. Super moment ! Just wanted to say a huge thank you to Theo and all at Latchi Watersports Centre. They helped make my wife’s birthday one of the most memorable ever, thank you! Would you like to save money on your Watersports? Join Latchi Watersports ‘the wave’ for rewards and big discounts, every month.